Be the first caller at 855-885-1035 to correctly identify the mystery newsmaker and win a $50 gift card to Giant and tickets to see Shakespeare Theatre Company’s performance of Potted Potter – the hit Harry Potter Parody that takes on the ultimate challenge of condensing all seven Harry Potter books (and a real life game of Quidditch) into seventy hilarious minutes. 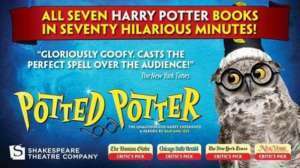 Potted Potter – the Harry Potter parody takes on the ultimate challenge of condensing all seven Harry Potter books (and a real life game of Quidditch) into seventy hilarious minutes. This fantastically funny show features all your favorite characters, a special appearance from a fire-breathing dragon, endless costumes, brilliant songs, ridiculous props and a generous helping of Hogwarts magic! For tickets and more information visit www.shakespearetheatre.org. Build your list with our online circular – then take it with you! For more information visit www.giantfood.com.